E por falar em política externa de grande potência, os navios de guerra russos continuam no porto de Tartus, na Síria. Assad ganhou sobrevida importante com essa manobra. Isso é que eu chamo de demonstração de força por parte de Moscou! O melhor é declaração do comandante da frota de que “a manobra nada tem a ver com a crise na Síria”… Gostei! Syrian authorities have called the visit of a Russian naval task force to the port of Tartus a “show of solidarity with the Syrian people,” the official SANA news agency reported. 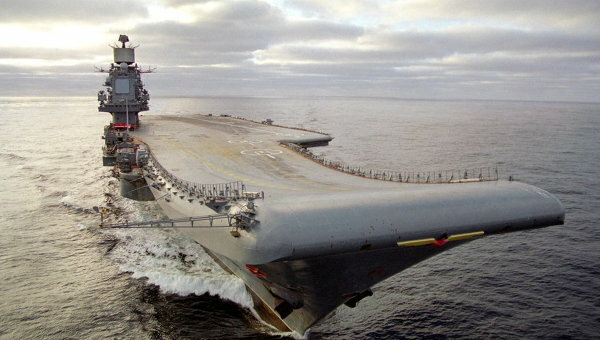 A Russian task force, led by the Admiral Kuznetsov aircraft carrier, arrived in Tartus on Sunday to replenish water and food supplies during a long-term training mission in the Atlantic and the Mediterranean. “We highly respect Russia’s honorable stance in support of the Syrian people,” SANA cited Governor of Tartus Atef al-Naddaf as saying. Russia maintains a Soviet-era naval maintenance site near Tartus as its only military foothold in the Mediterranean. Moscow is planning to modernize the facility to accommodate large warships, including missile cruisers and even aircraft carriers after 2012. The Russian Defense Ministry reiterated on Sunday that the visit of Russian warships to Tartus was not related to the current political crisis in Syria, and said the task force would leave the port on January 9 to continue with the training mission. Esse post foi publicado em Assuntos Internacionais, Defesa, O Levante e marcado frota russa, navios de guerra, Rússia/União Soviética, Siria, Tartus por Joanisval. Guardar link permanente.